Home / Curtains / What Curtains Are Best For Insulation? What Curtains Are Best For Insulation? Guess what? When it comes to the electricity bill, it’s not just your light bulbs that make it soar. You lose a lot of heat through the windows… literally. Next time you go up the walls with that bill, take a good look at your windows… are they insulated in any way? If not, the handiest fix is to buy insulated curtains. The good ones can reduce heat loss by 60% (if the windows are single glazed) and up to 40% – 50% (for double glazed windows). Note to self: in order for an insulated curtain to work, it needs do be drawn. Five of the best insulated curtains are found here and you can get a good idea about what might be right for your windows. In order for a curtain to provide good insulation, it should be made from thick, backed with thermally-insulating material, and be double layered with thick lining. A good insulated curtain is wider than the window frame, goes from floor to ceiling or has pelmets on top. 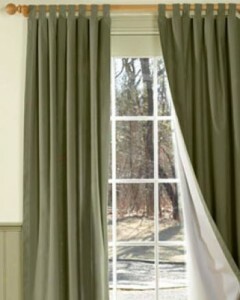 This curtain fits tightly against the wall or window frame. Your insulated curtain features an outer decorative layer which is protected by an inner lining. The curtain has high-density foam that blocks heat exchange and sound waves- yes, that’s a plus. Noise reduction comes as a treat! You don’t have to worry about the curtains getting moist over time since they have a reflective vapor barrier against moisture. You may notice magnetic strips sewn on the edges of insulated curtains. These magnets form a tighter barrier with the wall, giving more protection against heat loss. A good manufacturer of insulated curtains won’t neglect the style of these. Therefore, they come in various patterns, thickness and durability levels. Most of the insulated curtains are easy to take care of- mild dry cleaning should suffice for a fresh look. You can also vacuum them to keep dust away and give them their brightness back. Another option for keeping heat inside the house is to use insulated blinds. If you’d rather go for them, know that they need to be specifically branded as thermal. They are also made of two or more layers joined to form a cellular compartments to trap air, thus providing insulation. The insulated blinders fit the window frame, creating a tight seal that doesn’t let air go out. The market also gives the option of honeycomb blinds which trap air within their cells, acting like a double glazed window. In order for these blinds to work, you need to mount them within the window reveal, leaving a minimal gap (around 1/3 of an inch) for air to move around all sides. Every month you’ll „feel” the difference in your electricity bill once you’ve got your insulated curtains or any of the options that we mentioned so far.They protect your house from all four types of heat loss: infiltration, convection, radiation and conduction. Next What Curtains Make A Room Look Bigger?